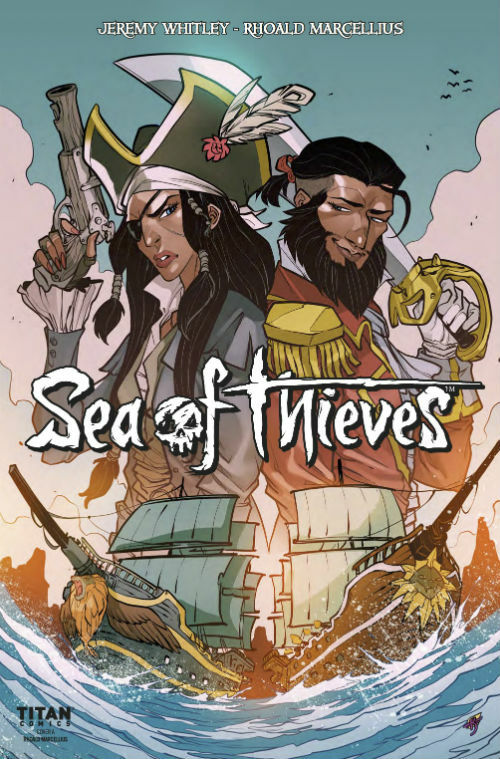 After the excellent first issue, the second chapter in the spin-off comic series of Sea of Thieves is now here, continuing the adventures of DeMarco and Lesedi Singh. Siblings yet rival captains of pirate ships, we follow them as they search for their fathers’ legendary treasure, hidden away in the Sea of Thieves. Following directly on from the last issue, the second instalment of Sea of Thieves has the two crews careening towards the fabled stretch of sea through some deadly fog. As the fog clears though, a third crew of pirates ambushes Lesedi and her crew, probably rueing the head start over her brother at this point. 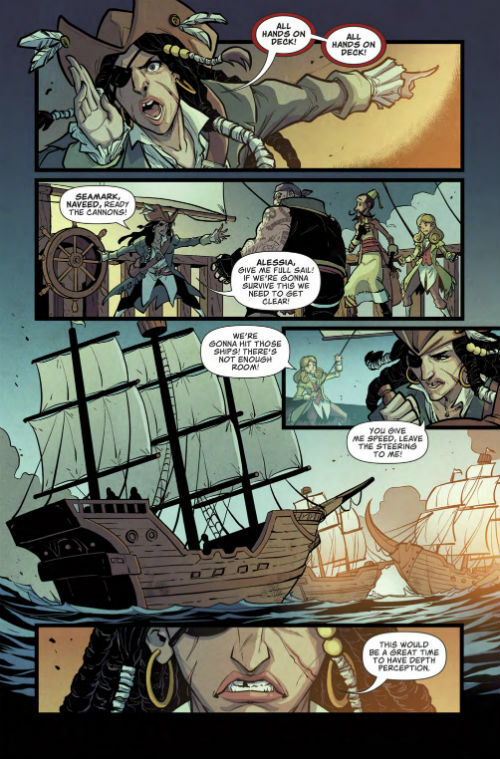 Most of the early part of the comic consists of this naval battle and with the constant shifting between several different pirate ships, it can be tough to keep up with. Particularly when DeMarco and his crew literally barge their way onto the pages. It keeps itself together with the humour and we start to see Mele Silvertongue fitting in with her new crew a bit more, helping others out when they are in danger. The second half of this issue is a much more serene affair – for a crew of pirates at least. Lesedi and her crew arrive at Sanctuary Outpost where they meet a strange man who knows about the lost treasure and the previous owner, Lesedi and DeMarco’s father. It is worth noting that not at one point so far has the name of their father been mentioned. No doubt this is going to be a big reveal towards the end of this tale. This strange man claims that the treasure in question belongs to his company, the Gold Hoarder Trading Company. Before he says too much more, Lesedi’s crew are once again ambushed by DeMarco who have caught up to them. Or rather, Mele ambushes a certain member of Lesedi’s crew, forcing the others to all step in. It’s because Mele is on a personal vendetta and attacks Alessia St. Marina, her former comrade – now on rival crews – who she blames for leaving her at The Unfired Pistol and ditching their plans together for the future. Other members of both crews step in and things do calm down, for a short period of time; the usual skulduggery and back-stabbing is just round the corner. factions such as the Merchant Alliance Trading Company, and an enemy type that players of the game will be all too familiar with plays an important role in the last couple of pages. It isn’t as fast paced or written as well as the first issue, but this second issue is going to be more appealing to fans of the game as it starts to introduce elements from the virtual world, finally proving itself as a tie-in comic and not simply a standalone story. It’s also good that you don’t know which crew to root for, because they are both despicable groups of people. But the comics don’t mean you must pick a side, as both get the same amount of page time. 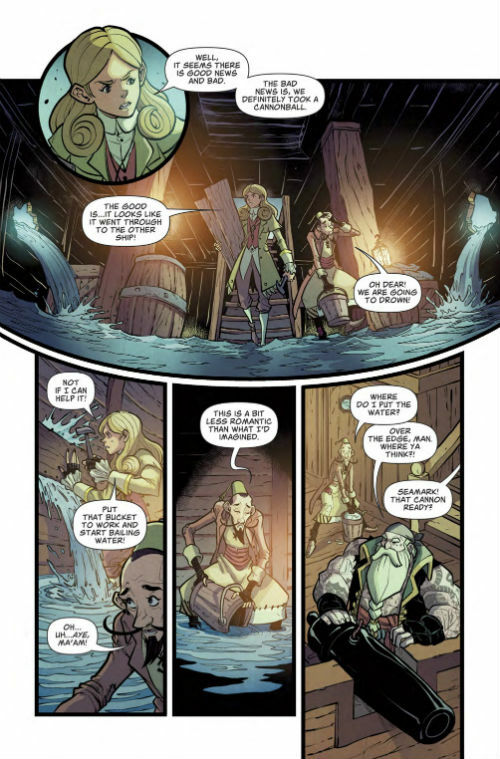 Titan Comic’s Sea of Thieves series has fast started to become more about the titbits of info it keeps dropping about who Lesedi and DeMarco’s father is, and what his treasure is. That, and the humour we have come to expect from anything Rare are involved in. But I can’t wait for it to continue.